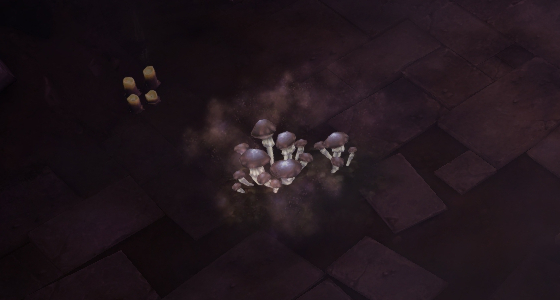 Whimsyshire is a secret level in Diablo 3. It is also known as a pony level or the cow level. The Staff of Herding is required to enter the level and crafting this staff involves farming for a few different materials. Entering Whimsyshire for the first time grants you the In The Land Of Killer Unicorns achievement, which rewards you with a Stars Banner Patter and a Unicorn Banner Sigil. Also, obtaining Wirt's Bell, one of the required materials for the Staff of Herding, grants you the Wirt's Case Scenario achievement. All the materials can be farmed in both Adventure Mode or Campaign Mode. Each material can only be farmed in a very specific place, so you always want to choose the mode that gives you the fastest access to that specific place. We farmed the staff after the release of Patch 2.1.0 and we found that the difficulty setting seemed to have no influence on the drop rates (we mostly played in Torment I). Note that most of the materials are not actually dropped, but rather looted from objects that randomly spawn, so this may help explain why we did not notice any conclusive change in drop rates. The first item you will need to craft the staff is the recipe, Plan: Staff of Herding, which drops from Izual in the Act IV. You can farm the plan in both Campaign Mode and Adventure Mode. enter the Great Span and defeat Izual. As you can see, you can gain some time by playing in Adventure Mode, because you can port directly to the Silver Spire Level 1. In Campaign Mode, you need to cross two additional zones: Crystal Colonnade and Gateway to the Silver Spire. The recipe is not guaranteed to drop from Izual, far from that. So, you will have to try many times before obtaining the plan. In Adventure Mode, simply leave the game and recreate. In Campaign Mode, leave the game and resume it to reset the quest and get Izual to spawn again. In the console version of the game, crafting the staff only costs 5,000 Gold and requires neither Leoric's Shinbone nor Liquid Rainbow. The Black Mushroom can be found in the Cathedral Level 1, in Act I. You can farm it in both Campaign Mode and Adventure Mode. port to the Act I, Cathedral Level 1 waypoint. As you can see, reaching the Cathedral Level 1 is faster in Adventure Mode, so we advise you to use that mode to farm the Black Mushroom. 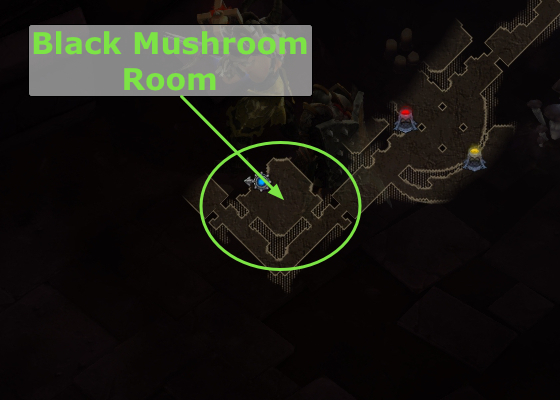 The Black Mushroom spawns in a room of very specific shape (see image below), which will most often appear in the bottom right corner of the map. So, whenever you enter the Cathedral Level 1, explore it in such a way that you try to locate the bottom right corner of the map. If the room there has the wrong shape, simply leave and recreate in Adventure Mode, or leave and resume in Campaign Mode. Once you find the room, you cannot miss the Black Mushroom, but here is a picture, just in case. 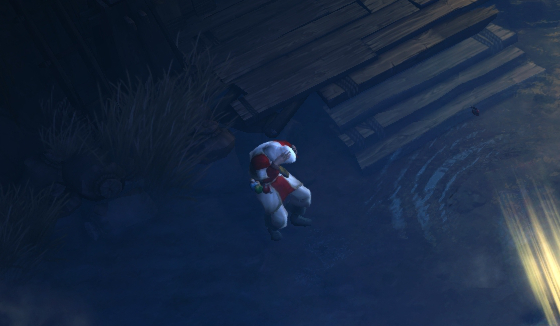 Leoric's Shinbone, which is not required on console, can be found in Leoric's Manor, in Act I. You can farm it in both Adventure Mode and Campaign Mode. In Campaign Mode, you need to start the game in Act I, Quest 9: The Imprisoned Angel, Part 2: The Cursed Hold. Port to the Leoric's Manor waypoint. 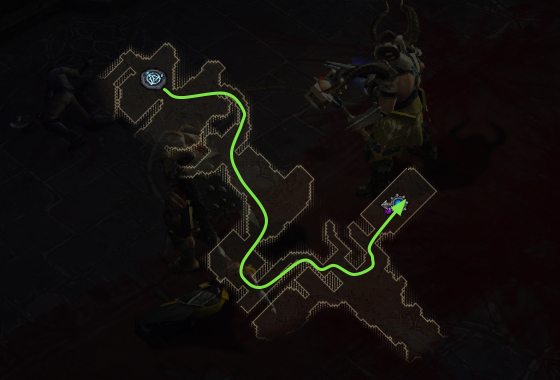 From there, follow the route shown in the image below (in Adventure Mode, the waypoint is even closer). In Adventure Mode, you need to port to the Leoric's Manor Courtyard waypoint in Act I. From there, use the entrance immediately next to the way point (to the northeast). Once in the Manor, clear the enemies and enter the first room on the right, before the flight of stairs, as shown in the image above. At the end of the room in which you arrive, there is a fireplace. 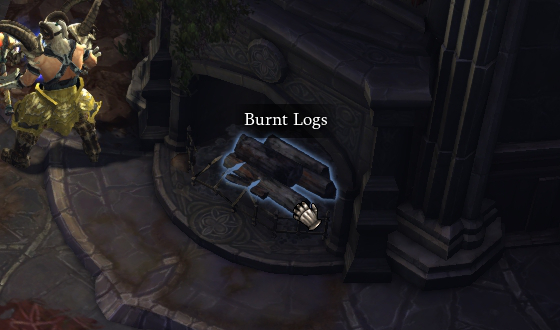 If there are Burnt Logs in the fireplace, click them and they will drop Leoric's Shinbone. If not, then leave the game and resume it to start over. Wirt's Bell is sold by Squirt the Peddler in the Hidden Camp, Act II for 100,000 Gold. 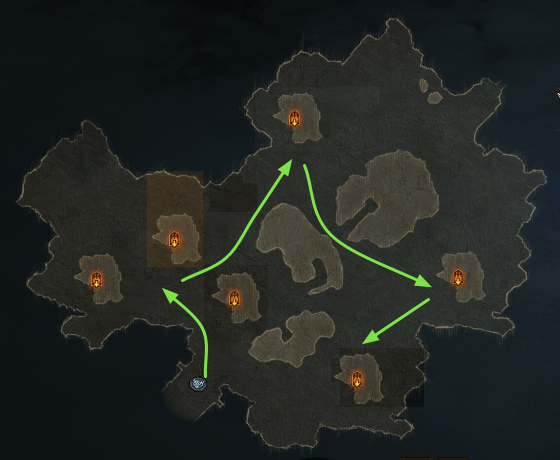 To get there, simply create a game in Adventure Mode and use the Hidden Camp waypoint from Act II. When you spawn in the Hidden Camp, Squirt is a few meters above you on the screen. Liquid Rainbow, which is not required on console, is found in the Mysterious Chest, which has a chance to spawn in the Mysterious Cave in the Dahlgur Oasis, Act II. The Mysterious Cave is not a guaranteed spawn either, for you must first find Zaven the Alchemist in the Dahlgur Oasis and speak to him to open the cave, but he does not always spawn. if you do not find Zaven the Alchemist or if you do not find the Mysterious Chest in the Mysterious cave, leave the game and resume. Zaven can easily be missed, because you cannot interact with him until you have killed the nearby monsters. Also, he does not stand out very much from his environment, so here is a picture of what you must be looking for. The Gibbering Gemstone has a low chance to drop from Chiltara in the Caverns of Frost Level 2, which are located in the Fields of Slaughter, Act III. Farming the Gibbering Gemstone is the same in Adventure Mode and Campaign Mode. 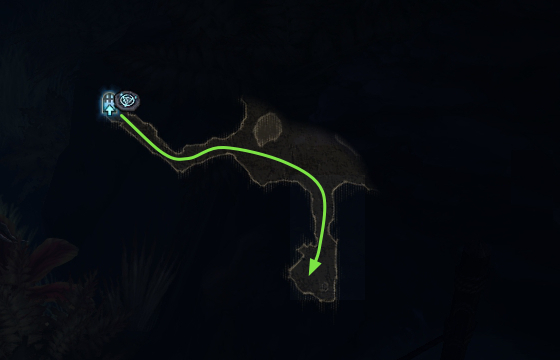 In Adventure Mode, you need to port to The Bridge of Korsikk waypoint. In Campaign Mode, you need to create a game for Act III, Quest 6: Siegebreaker, Part I: Begin Quest, and port to The Bridge of Korsikk waypoint. In the image above, you can see the Fields of Slaughter with The Bridge of Korsikk waypoint in the lower left corner. The 6 possible spawn locations for the Caverns of Frost have been marked. 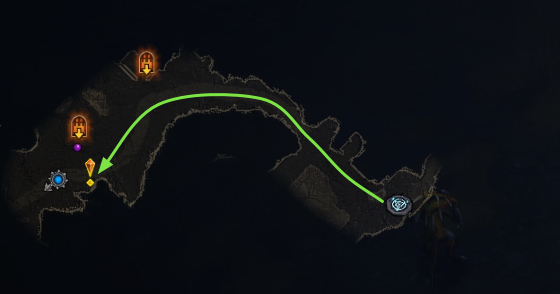 So, the idea is to get to the Bridge of Korsikk waypoint and circle around the map to check all the possible spawn locations. If you find the Icefall Caves, you can leave and recreate (or resume in Campaign Mode), because there will always be exactly one subzone that you can access from the Fields of Slaughter, and it will be either Icefall Caves or Caverns of Frost. If you find the Caverns of Frost, head for the Level 2, find Chiltara and hope for a drop. If she does not drop the Gemstone, simply leave and recreate (or resume in Campaign Mode). In Adventure Mode, if you get the Bounty for the Icefall Caves, you do not even need to go to the Fields of Slaughter. You can recreate right away and the Caverns of Frost will not be there. After crafting the Staff of Herding, put it in your inventory and head for the road to Old Tristam in Act I. In Campaign Mode, create a game for Act I, Quest 2: Legacy of Cain, Part 1: Begin Quest, and port to The Old Ruins waypoint. In Adventure Mode, simply port to The Old Ruins waypoint in Act I. When you reach the waypoint, follow the path in the image above. At the quest sign, you will find the Ghost of the Cow King. Speak with him and he will transform the red chasm next to him into a portal to Whimsyshire.